In 1921, just several days apart, two extraordinary films of the Czech silent film production premiered in the Prague Lucerna cinema – Příchozí z temnot (The Arrival from the Darkness) and Otrávené světlo (The Poisoned Light). These films actually have much more in common than just their release dates. Both movies enjoyed the support of, at that time, a remarkably prolific film community, gathered around the progressively thinking creative duo of Jan Stanislav Kolár and Karel Lamač. Kolár, an innovative narrator, together with the stylistically precise Lamač, their friends and closest colleagues, mainly cameraman Otto Heller and actress Anny Ondráková, were attempting to infuse Czech film with successful features of international cinema. Out of all the surviving films of this era, Příchozí z temnot and Otrávené světlo represent the most convincing results of these creative efforts. That said, their final shape was ultimately formed by different influences in terms of narrative and stylistic techniques. One of the most important factors, rather exceptional for those times, was the production and financial stability, provided by generous film benefactors, which then enabled Kolár and Lamač to cultivate their narrative inventiveness as well as the necessary craftsmanship. During the filming of The Poisoned Light, the filmmakers were able to rely on Dr. Baštýř, who, aside from providing crucial financial support, was also readily engaged in, what we would call today, production. Thanks to the entrepreneurs Jan and Vojtěch Škorpil, Příchozí z temnot was filmed on the fully furnished premises of the Berlin film studio Am Zoo, which was, in the context of Czech production, a completely exceptional decision. Despite the risks associated with financial contributions and uncertain returns on investment from cinema sales, the benefactors had, in both cases, granted the creators considerable filming freedom. Most likely though, Kolár and Lamač merited such a convenient arrangement thanks to the success of Zpěv zlata (The Song of Gold, 1920), a film with an international twist. This enabled them to work systematically, filming, adopting foreign influences, all the while without any larger setbacks or issues, unlike it was later that year with Kolár’s shooting of the comedy Roztržené foto (The Torn Photograph, 1921) for the AB company. The greatest source of inspiration for Otrávené světlo turned out to be Hollywood production, which after World War I began to completely dominate local film distribution. While filmmakers were in some cases attempting to attract audiences by relying on homegrown humour or likable national topics, a completely different strategy was introduced by the intentional adoption of foreign conventions. Vladimír Slavínský fully exploited his own athletic talents during the shooting, arranging exhilarating stunts and tricks, thus openly following in Hollywood’s footsteps. A different approach was represented by Václav Binovec and his persistent efforts within the Czech film scene to transform the mediocre Weteb company actress Suzanne Marville into a true movie star. Otrávené světlo, though, was a case of a complex identification with Hollywood narrative and stylistic techniques, which both creators tested in their previous works – Kolár with Gustav Machatý and Přemysl Pražský in the playful Dáma s malou nožkou (The Lady with the Small Foot, 1919), Lamač in the slapstick Gilly poprvé v Praze (Gilly in Prague for the First Time, 1920), and afterwards both together in the already mentioned Zpěv zlata. The film, on which, of the two creators, Kolár had a greater creative impact on the screenplay, works with pivotal features of Hollywood narration while at the same time developing them with ingenuity. The entire chain of events carefully links the relationship between cause and effect, where one action results in another. The story is told by the main character, Mr. Bell, who witnesses a robbery of blueprints for a revolutionary invention, decides to act on his own and pursues the main villain to spoil his plans. The investigative storyline is eventually interjected when a love relationship develops between Mr. Bell and a young woman, Anny, a daughter of the robbed inventor. Both storylines gradually blend and follow each other throughout the movie in order to create a solid framework for the narrative. At the same time, the film is pursuing utmost clarity and justification of all appearing moments and features. Aside from using these drafted storytelling Hollywood devices, also worth mentioning is an exceptionally brilliant use of cliffhangers, adapted to the Czech movie landscape and cinema facilities. Cliffhangers, moments in which individual episodes of popular shows would end at a moment of the highest tension or the seemingly inevitable destruction of the main protagonist, worked as a popular technique, hoping to ensure the audience would return to the movies the next day to witness the resolution of delicate situations. Kolár and Lamač adopted this trick for the feature film format. Since nearly all movie theatres were furnished with only one projector, films had to be screened one reel at a time, with a forced break in between. Otrávené světlo was therefore devised so that at the end of each reel, an element of tension or enigma was put in the film, encouraging the audience to patiently wait those few minutes while the film reels were swapped. This form of adaptation to the screening conditions is reflected in the rhythmical concept of the film, which reaches several small climaxes throughout the viewing prior to the grand finale. In addition to masterfully executed action scenes, the contemporary press particularly praised the stylistic features of the film, which were mainly the work of Lamač and his skilful cinematographer Heller. As a known admirer of the Hollywood style, Lamač carefully and steadily directed the viewer’s attention within each individual scene, mainly by the means of meticulous footage editing. To focus on important elements, actions or gestures of the actors, the creators relied on systematic intercuts into the open space, instead of focusing on the character’s motion from the background into the foreground within the camera frame (or possibly from the sidelines of the frame to its centre). With a close up, the audience could then easily see an important object or an expression on an actor’s face. However, these stylistic features ultimately serve to make the narration as compelling and at the same time as comprehensible, entirely in the spirit of Hollywood cinema. Even though Příchozí z temnot used the same film crew, the division of creative responsibilities was quite different than in Otrávené světlo. This time, the creative spotlight for this finely tuned piece of work was taken by Kolár. At first, he reworked the original story by Karel Hloucha into its final screenplay form, adding important motives and perspectives. At the same time, he was, as the only director, fully responsible for filming at the Berlin studios or the surroundings at the castle Okoř. In this project, Lamač therefore functioned mainly as one of the film stars, but along with Heller would also lend his craftsmanship to Kolár, especially with difficult trick shots. Kolár’s appreciation of European cinema strongly inspired him, and this can be felt throughout the film, which rather strayed away from the typical Hollywood detective story. 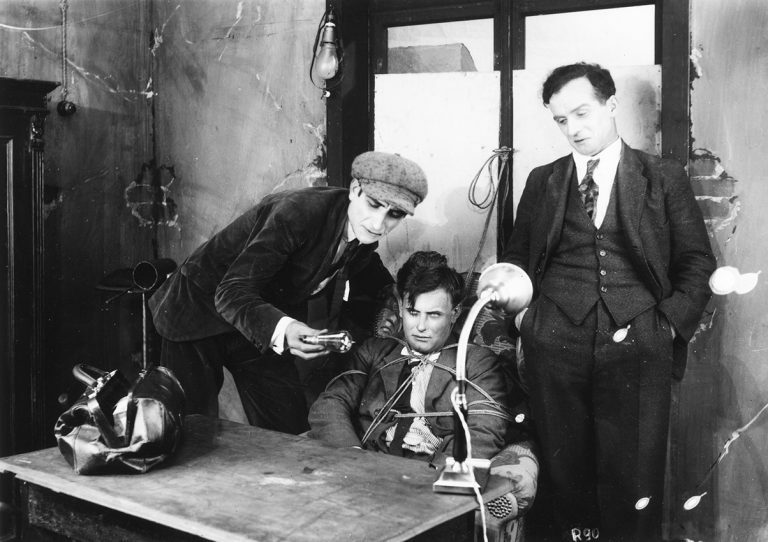 Kolár admitted the influence of especially German production, leading with Der Student von Prag (The Student of Prague, Stellan Rye – Paul Wegener, 1913) and a fascination with the Danish Nordisk, mainly with films featuring Valdemar Psilander. His attempts to transpose some elements of the art and poetry of the European filmmakers were realised in Učitel orientálních jazyků (The Oriental Languages’ Teacher, 1918), which he wrote and co-directed with Olga Rautenkranz, and perhaps even in the unfinished Akord smrti (The Chord of Death, 1919). It was not until Příchozí z temnot that Kolár was able to fuse his knowledge of inspirational sources and his narrative skills to create an amazingly complex story, overflowing with ideas. The film represents, within the Czech context, a completely unique approach towards experimentation with structure, especially the narration, relying on various subjectivising techniques. Inspired by European filmmakers, Kolár is able to achieve an unexpected impact on the audience thanks to his sophisticated work with characters’ fantasies, memory flashbacks or dream aspects, all of which considerably advance the story and guide the viewer’s attention. Unlike the straightforward narration of Otrávené světlo with somewhat clearly formulated relationships between the main characters, Příchozí z temnot offers, thanks to the use of subjectivisation processes, a much more complex structure and a tangled relationship network among all parties involved. Unsurprisingly, the central role is portrayed by “the arrival from the darkness”, Ješek, who is awakened from a deathly sleep by the main character, Dražický. Upon entering the story, “the arrival” changes the direction of the picture completely, straying away from the love triangle conflict between Dražický, his wife, and a jealous neighbour, Bor. Using Ješek’s storytelling on past times and events, leading up to his state of hibernation, Kolár creates multiple parallels. These relate to both time frames (Rudolfinian past/present) and mainly to the characters from those time periods. This multitude of motives and conflicting efforts emanating from every character is eventually connected in a carefully constructed finish with an unexpected ending. The outcome of the film can be attributed to an abundant use of subjectivising processes but also, considering Czech conditions, to an uncommonly extravagant production. Skilful interior design, such as the impressive alchemist laboratory, together with the castle Okoř grounds and its surroundings, helped create quite a compelling atmosphere. Its expressive tone, unmistakably influenced by period European production, fully supports the attractive story filled with magic and occult experiments. Both Příchozí z temnot and Otrávené světlo represent unusual sparks of creative efforts and the ambitions of the filmmakers, who were in their time inspired by international trends and techniques. Considering different sources of inspiration, these two films comprise two sides of the same coin.